They really should have worked the word “Elbow” or “Macaroni” into the title, as once you put a pound of elbow macaroni into a 9 x 13 dish, the recipe becomes 80% elbow macaroni. Also, it becomes much heavier! Didn’t modify this too much, as I was cooking it. I would probably use only 1/4 teaspoon of pepper instead of 1/2 teaspoon, but that could be on me for not sprinkling the pepper in a better fashion. But it just looked like a lot of pepper. I would also use two tablespoons of olive oil, as the chicken was a tad dry. I definitely cooked it at 30 minutes, as opposed to 40 as I knew with the additional 20 minutes of cooking, at the end, that it the chicken was definitely going to get cooked. Now I’m wondering if I should have cooked it for 25 minutes upfront and added five minutes during the second round? As our Progresso Panko break crumbs didn’t really firm up. I don’t trust broiling, it seems high risk and no real reward. Maybe I’ll try that, next time. We went with the Italian variety instead of Japanese, it felt right with what we were preparing for. Apparently Campbell makes a Cream of Mushroom AND Cream of Chicken Soup, in the same can. So instead of this recipe being 50/50 Cream of Chicken and Cream of Mushroom, it was more 75/25. So we’ll definitely either buy a can of each soup, next time, or we’ll buy two cans of the combo soup. I didn’t even know such a combo soup existed! It looked more like Cream of Mushroom though. 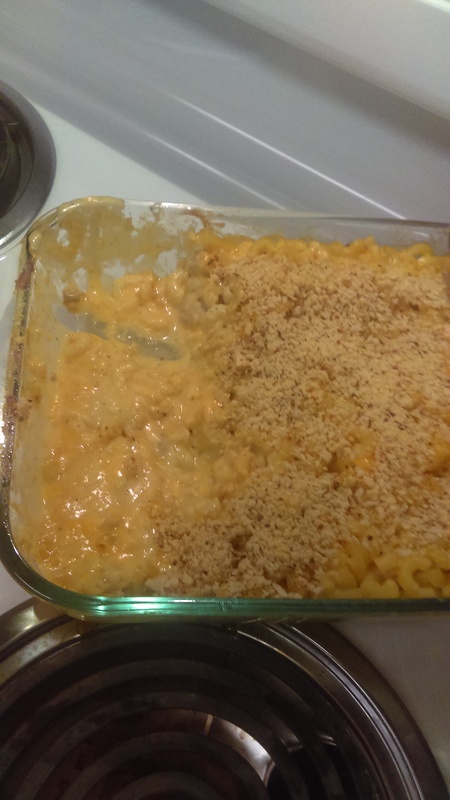 Overall, besides the Panko not being more firm, it turned out pretty well. I also have to shred the chicken more, as it was still rather chunky instead of being more shredded. With that much macaroni, the chicken got a tad lost. I was able to watch the McGregor v Mayweather fight on Saturday Night. After hearing about it so much on The Fighter and the Kid and Prinze and the Wolf, I got the idea in my head that I would like to watch it but figured I couldn’t. I had committed to watching highlights and whatever clips I could obtain but I was able to enjoy watching the fight. I didn’t realize rounds were like three minutes, so I knew I wasn’t going to be up past midnight. I still was, though, as I wanted to see if anyone matched my outrage over the Technical Knock Out. Which, I still find suspect. A match of this caliber, and on such a large state, shouldn’t be ending on any technicality. McGregor didn’t even touch the ground! He could have just moved against the ropes for the rest of the minute and a half and sat down during the brief break. It did look like he was getting gassed during the seventh round but making it to ten is amazing! I was super impress with referee Robert Byrd, with lots of his calls but that final call, tainted the whole thing. I’m glad McGregor said something about that, after Mayweather’s speech. McGregor was talking fine and was a tad dazed, that’s all it was. Television-wise, we finally finished Daredevil Season Two. I’m not sure when we’ll start on Luke Cage. We opted to watch Arrow’s Season Five’s first episode instead of making progress on Person of Interest. It was really late and I had the thought that we started Arrow, when it first came out, before committing to just watching Supergirl and Flash as it aired. As, at that time, I knew that those two shows were going to crossover and I knew we would be fine with watching the Arrow and Legends episodes of the mega-crossover, without being too lost or spoiled on their individual subplots. I’ll have to do some research with the upcoming seasons to see which shows we need to follow. I bet we could do the same thing and just stick with Flash and Supergirl. Our next episode of The Office is Season Three’s Back from Vacation. I woke up this morning, wanting to jump back into Jodie Whittaker’s The Assets, so I might try to sneak in another episode of that, as that is only eight episodes, the last one appears to be an interview with the real Sandra Grimes. I’m on the second episode of that.